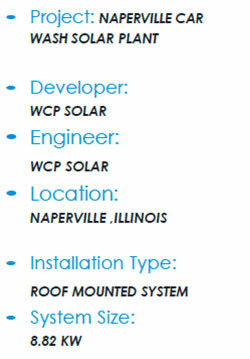 WCP Solar was contracted by Naperville Car Wash to construct a roof mounted solar system located in Naperville, Illinois. This grid connected system ties directly into the Commonwealth Edison Utility’s (ComEd) power grid and generates enough electricity to provide a substantial amount of power of the electrical needs of the facility. The project was sized at 8.82-kWp1, using 28 Canadian Solar CS6X Poly photovoltaic panels rated at 315-W mounted on a 10 degree tilt on a flat roof. The system also employs 28 M250 Enphase Microinverters, to convert the DC energy produced by the solar plant into AC energy. In addition to providing significant energy savings, the solar system will produce approximately 56 Solar Renewable Energy Credits (SREC's)in the next 5 years. Completed on April 11th 2016, this project was another example of strong project management and leadership by the WCP Solar team. 1 Estimated production of over 272 Tons of CO2 - Equivalent to planting over 6324 trees or driving reduced by 541,574 auto miles, or 27,620 gallons of gasoline.